I'm sure you've all already seen this by now, but I'm so excited for it I just HAD to have it on my blog! LOOK HOW SPARKLY! (I am seriously like a magpie over this sort of stuff). NEW! The MIRRORBALL Collection, a completely unique glide-on glitter that will revitalise your entire polish collection! Wear alone or over your favourite colour polish to give a frosting finish, taking nails from boring to BLING! Boogie Nights, a multicoloured mix of intriguing purple, pink and blue! The Mirrorball Collection launches (with LIMITED EDITION metallic coloured caps!) 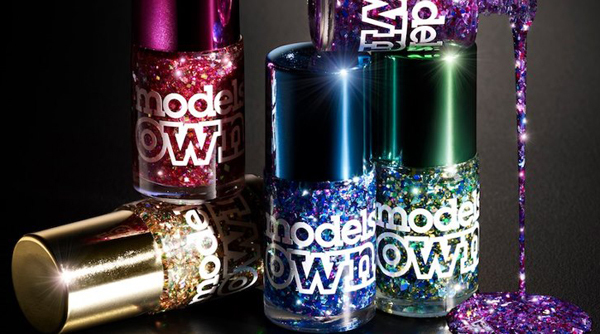 exclusively at the Models Own Bottleshop on Thursday, September 6th, on the Models Own website from Monday, September 10th and in Boots stores nationwide from Wednesday, October 3rd. I can't wait! I live nowhere near the Bottleshop so I'll have to wait but I'm excited to try them. I think I'm most excited for Dancing Queen. Will you be buying any of these? Dancing Queen looks just perfect for me. I hope they go to Sephora stores soon! Omg, all beautiful. I shall be buying them all! OMG what a drool-worthy picture. Will these come to the US? Thank you hun, I hope they do! I`m your new follower and i loove your nails & blog.Can you follow me?